60 X 22 X 78(L XBX H) inches approx. Traditionally made by skilled artisans with premium finishing. 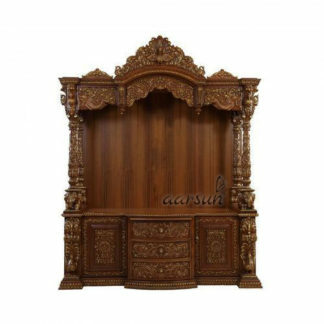 Aarsun Woods bring you Handmade Wooden temple made up of premium quality Teak Wood and Ply. There are two drawers and two Puja cabinets for puja essentials like rosewater,matchsticks,incense sticks, holy books etc. Above the base, there is main place for deity called “Garbagriha” where you can place your deity in safe manner. There are two beautiful pillars carved which give very traditional and elegant look to your temple. Rising to the roof there is beautiful floral and peacock design in mehraab area which is beautifully carved by our skilled artisans. The temple is best suitable for home and for the office. As we are the manufacturers so customization are available as per the requirement of the customer.We provide free shipping across India.